WIXTED CLEANING is a highly skilled and experienced organisation who delivers a professional Contract Office Cleaning Service to corporate clients throughout Bedfordshire, Buckinghamshire, Hertfordshire, and London. Formed in 2002, the head office is in central Bedfordshire where our accommodation houses the regional managing director and a short line of management command. To effectively meet the diverse needs of its clients, a Client Care System is currently in place to remain in regular contact with you, to ensure you are happy with our service and have the opportunity to discuss any new issues or business needs. In addition as part of our commitment we ensure regular inspections are carried out along with management reviews so clients’ requirements are not only met but constantly exceeded. These standards have seen us grow to an established successful contract cleaning company, retaining clients and staff, and offering the complete range of cleaning services you need throughout Bedfordshire, Buckinghamshire, Hertfordshire, and London. A quality service focused on excellence and professionalism is endorsed to effectively meet the diverse needs of our clients. WIXTED has a workforce that are well trained and motivated with the ways and means to carry out its clients expectations effectively and efficiently not once but every time. Through the implementation of a short management chain within our offices in Millbrook, Wixted Cleaning are able to achieve the flexibility required to give a client whatever their needs are at a moment’s notice. An operation manager of the right calibre will be responsible for the day to day management of the cleaning operation. Each manager will have a significantly low number of contracts to ensure that the location is managed on a pro-active basis. In addition to this the Director of the company will always retain personal contact with the client to make sure that their needs are always placed first on the list of priority. The provision of an effective Client Care System is based upon supporting the Director’s on-going dialogue with our clients. This is achieved with the use of our Client Liaison Card, and this is a record of communication between the client and the operation manager and should be filled out two monthly. This will be discussed with the managing director on a two monthly basis. We will also install a communication book into the premises when we commence a contract as a method of effective dialogue between the client and WIXTED . In addition to these commitments not only will our operation manager’s retain effective communication with the client, but also the business development manager who is responsible for arranging the contract will retain an on-going relationship to ensure that any new business needs are met. 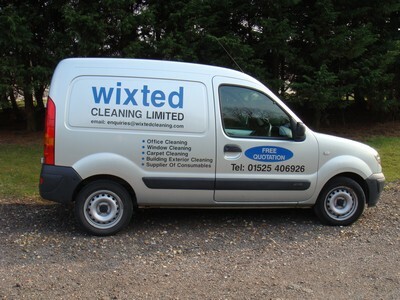 The managing director of WIXTED CLEANING takes personal pride in all the activities of the company commencing from the start of a contract right through to the effective and satisfactory completion of the work schedule and programme. It is recognised that the provision of quality cleaning services which consistently conform to the agreed specification, work schedule and programme is key to client satisfaction and it is the responsibility of all the members of the team with the director to retain effective dialogue with the client. This will ensure that all the operational details of the programme are completed to the required standard and within the time frame agreed. We ensure that all employees receive full training on site to not only our own in house training programmes but also onsite training to meet the client’s needs and will be documented with the use of our Training Record Form. This will be appraised every twelve months or as training is required. The success of any organisation and that of its employees depends very largely on the employees themselves and we consider that every employee is a part of the team and has equal importance in effecting the final result of the service supplied to the client. We are firmly committed to the principle of equal opportunities in employment whereby the talents and the resources of all our employees are utilised to the full and our aim is to ensure that no job applicant, employee or worker is discriminated against either directly or indirectly on the grounds of race, colour, ethnic or national origin, religious belief, political opinion or affiliation, gender, marital status, sexual orientation, gender reassignment, age or disability. The company also recognises that the successful implementation of its Equal Opportunities Policy makes sound sense, and helps create a better quality working life in which we can more readily fulfil our social responsibility towards our people as well as to the communities in which we operate. The company is firmly committed to a policy which aims to ensure that all of our employees are provided with safe and healthy working conditions in strict compliance with our clearly defined Health and Safety Policy and Code of Practice; which is designed to operate in harmony with our host clients own policies and current legislation. All staff our given training regarding health and safety in their induction training program. We are fully conversant in COSHH and the many legal regulations that cover the work place. Where possible we will use “green products” that are COSHH registered to complete the task. In the event of a green product not being available an alternative approved stock item will be used during office cleaning. Our clients are based throughout Bedfordshire, Buckinghamshire, Hertfordshire, and London .